In October 2015 we had the honor of organising the Opening Conference team building event following the merger of two security enterprises based in Switzerland. The client requested an activity out of the ordinary, where the employees would have to express their vision of the future of the company… And it resulted in The Big Picture! All we needed was an enormous hotel meeting room covered in plastic from floor to ceiling, ten work stations with acrylic paint, paint brushes and a 2×2 meter canvas. 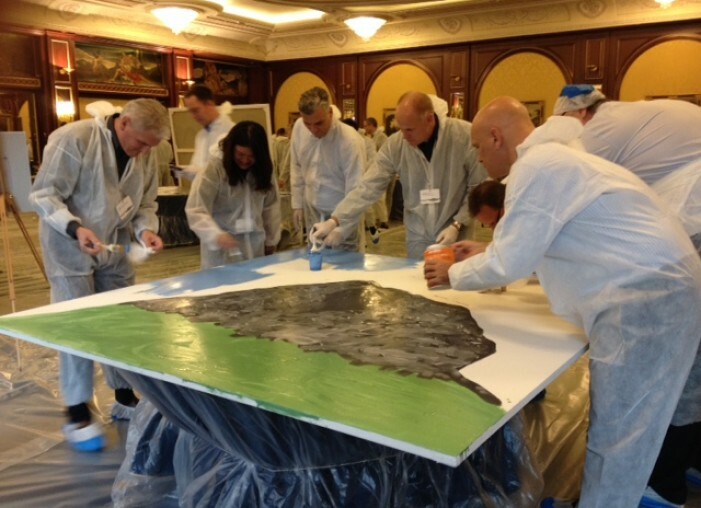 The task was to create a masterpiece representing the values and the future of the company after the merger. The participants, divided into teams and dressed in disposable overalls and shoe covers, had one hour at disposal to create their work of art. Each with a brush in their hand and a corner of the canvas to fill got to work. The winning combination was creativity, collaboration and initiative as the activity proceeded and the paintings took form. In the end all masterpieces were put on display and the winning team was announced! …and here is the video!